What partial pressure of oxygen is toxic? Short answer: Oxygen is toxic above a partial pressure of 1.6 bar. The normal partial pressure of oxygen in the atmosphere is about 0.2 bar. Resting individuals can tolerate 1.6 bar of oxygen , but only 1.3 bar when exercising. Symptoms of toxicity can occur after several days at pressures above 0.5 bar. Pulmonary toxicity occurs after prolonged exposure to partial pressures of oxygen greater than 0.5 bar. 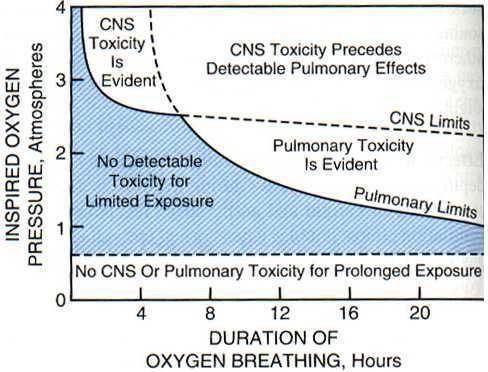 The diagram above shows that oxygen toxicity depends upon both the oxygen pressure and the duration of exposure. The safe duration of exposure becomes shorter as the partial pressure of oxygen increases. Above 2.5 bar, CNS toxicity appears before pulmonary effects are detectable.